Winston Churchill was 90 years old, living in his home at Hyde Park Gate in London, when he experienced a massive stroke. Fighting back for ten days, Britain's great wartime leader died on January 24, 1965. His death came on the same day, nearly at the same minute, that his father—Lord Randolph Churchill—had died 70 years before. In this video clip, Sir Winston's granddaughter, Emma Soames, recalls what it was like for a 14-year-old to lose the man whom his country later voted "The Greatest Briton." During a striking moment in her story, Emma relates the split-second when the sun shone on her Grandpapa's coffin ... while the funeral congregation was singing "Battle Hymn of the Republic." It was otherwise a very bleak and dreary-weather day. In a totally unscripted event, crane operators along the Thames River lowered their cranes to a half-mast position as Sir Winston's flag-drapped coffin passed by. It was just one of many signs of respect which people gave to their fallen leader on the day of his January 30th funeral. He was laid to rest in the small graveyard of St. Martin's Parish Church—in Bladon, Oxfordshire—close to Blenheim Palace where he was born. Twelve years later, Lady Clementine Churchill (also known as Baroness Spencer-Churchill) was buried alongside her husband. On the 50th anniversary of VE (Victory in Europe) Day, Churchill's grave site was decorated with bouquets of flowers, bearing notes of thanks, from people around the world. Churchill Urges: "We Must Arm"
Churchill and "The Gathering Storm"
"Give Us the Tools and We Will Finish the Job"
Churchill Pledges "Blood, Toil, Tears and Sweat"
BBC News video clip, online via BBC News' channel at YouTube. Copyright, BBC, all rights reserved. License: Standard YouTube License. Clip provided here as fair use for educational purposes. 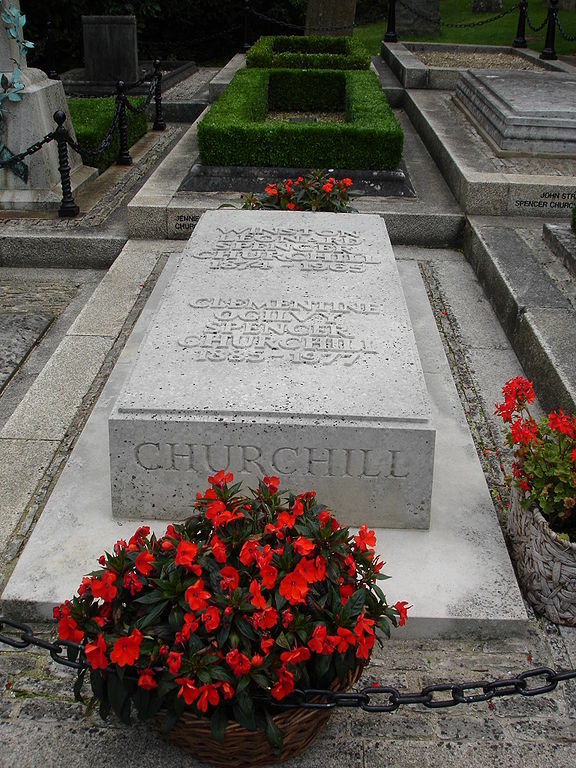 Churchill gravesite: Photo by LordHarris; online via Wikimedia Commons. Public domain. Bos, Carole "Death of Winston Churchill" AwesomeStories.com. Jan 24, 2015. Apr 19, 2019. Churchill - "We Must Arm"
Churchill - "We Shall Never Surrender"